Bread, Bikes, Beaches . . . . . .
A couple of Saturdays back Jan and I hitched a lift with Marc (one of my work mates) to Rockhampton for the day. Marc’s wife had 2 music lessons, the rest of us got to do a bit of shopping. I got some riding gear – boots, Dragin jeans (lined with Kevlar) and some waterproof over-pants. Also got a bikers swag for my upcoming long weekend trip. We also got a new TV to replace the Conia crap that came with the van. Seems the “nice” importers declared one company bankrupt to dodge a faulty batch of TVs and have since started importing them again using a very similar company name. So much for our consumer laws in Australia! Got a Grundig this time, with 5 year warranty thru Hardly-Normals. 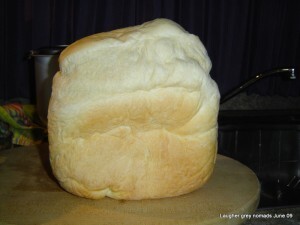 Also wangled a good deal on a bread maker. 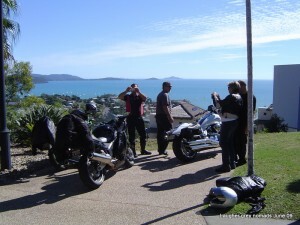 Marc organised a bike ride up to the Whitsundays, with 2 nights camping on his mates front lawn.Five of us turned up on Saturday morning for the 550km ride thru Capella, Middlemount, Nebo, Marian (bypassing Mackay), thru Prosperpine to Cannonvale/Airlie Beach. We arrived in time to set up camp in daylight and do a run to the shops (pub, mainly). 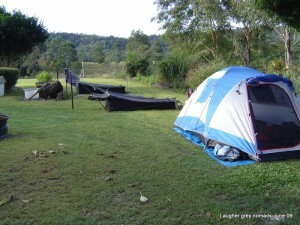 Mike & Karen's tent, my swag, then Marc's & Terry's in Grizz's front yard, just out of Cannonvale. 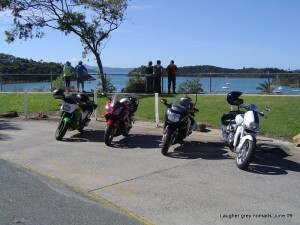 On Sunday we rode into Airlie Beach for breakfast and had a look around Airlie Beach and Shute Harbour. 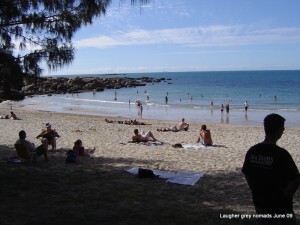 Then we went up to Bowen for lunch. For all you southeners, the temperature got to 27 and I’m told the water temperature was still 25. Sunday arvo and night saw an impromptu jam session of local mussos at Grizz’s place. And a couple of cold ones as well. Marc's mate Grizz (far right), on his veranda - warming up for a jam session. Fellow riders Mike, Terry & Karen round the table. 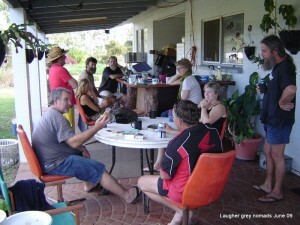 Monday saw some kerbside repairs on Mike’s bike and then the 550km trip back to Emerald. Lunch at the Nebo pub – a magnificent example of an “old” Queensland pub, with a great menu – gave us a plan for another trip in the future. We got home at about 5pm, a bit saddle sore but very happy after a memorable long weekend. Jan had an enjoyable break in Emerald. Our current next door neighbours are a couple from Narooma and they know some of our Moruya friends – sure is a small world. June 9th just happens to be my older sister’s birthday, but for me this year it also was the first day since we headed north last November, that I have worn a jumper. The morning are now a bit cool, but most days by 11am its back to short sleeved shirts. The Triumph dealer from Rockhampton had a test ride day in Emerald last Sunday. They had 7 models to choose from. I paticularly enjoyed riding a Speed Master – a cruiser with a retro style. Asked for a changeover price, but the dream was shortlived when the dealer came up $2K short on the trade-in. Oh well, back to work for another week.